The queer pleasures of Shakespeare are legion, from bawdy romance between cross-dressed lovers to raging jealousy that reaches beyond any simple classification of desire. Salome Wilde's first edited collection of erotica offers ten titillating tales spanning the LGBTQ spectrum based on some of Shakespeare's most well-known plays and most memorable characters. Authors, including seasoned pros and fresh faces, take readers on lustful adventures in Shakespeare's era, our own, and far beyond. 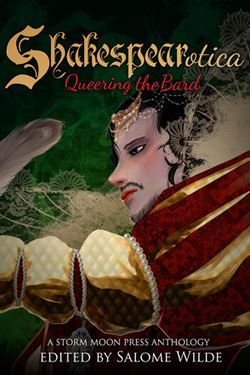 Whether through comedy or drama, by queering a favorite play or depicting wicked backstage antics in contemporary productions, there's something for every Bard-loving reader, and even those new to his intricate, intimate delights. Available via Amazon.com and other vendors.